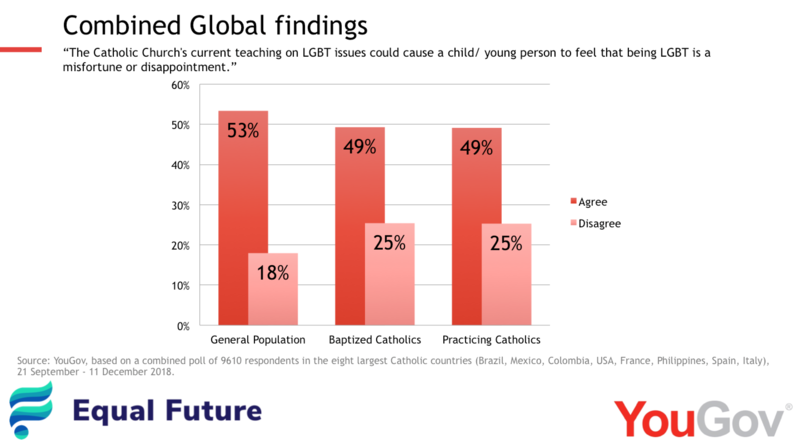 The Equal Future 2018 Campaign commissioned international polling agency, YouGov, to carry out an international poll to establish attitudes in the Catholic world towards damage to children and young people from LGBT stigma. 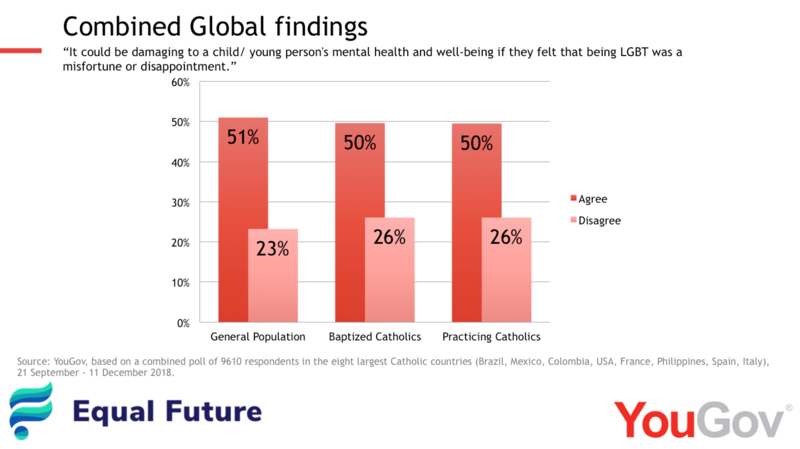 The poll, commissioned in part in response to the stated desire of the Catholic Church to understand the views of people as to “cultural and religious factors [which] can lead to exclusion” of young people ahead of their Synod on Young People in 2018, remains a vital resource for understanding the attitudes of both Catholics and non-Catholics, in the countries concerned, towards this critical problem. The polling was conducted by YouGov in eight of the world’s largest countries of the world, selected because they were also the world’s largest eight countries in terms of baptized Catholic population and collectively comprising half of the world’s total population of baptized Catholics. These are Brazil, Mexico, Columbia, Philippines, United States, France, Spain and Italy. The poll found significant levels of recognition across the general (Catholic and non-Catholic) populations of these eight countries that damage can be done – over half the population agreed that It could be damaging to a child/ young person’s mental health and well-being if they felt that being LGBT was a misfortune or disappointment. 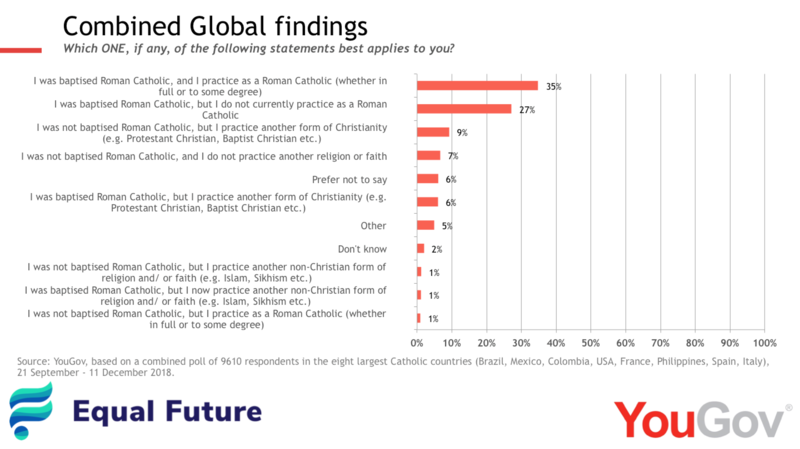 Across all markets, baptized Roman Catholics (who may or may not be practicing) and Practicing Roman Catholics were even more likely to agree than their general populations. 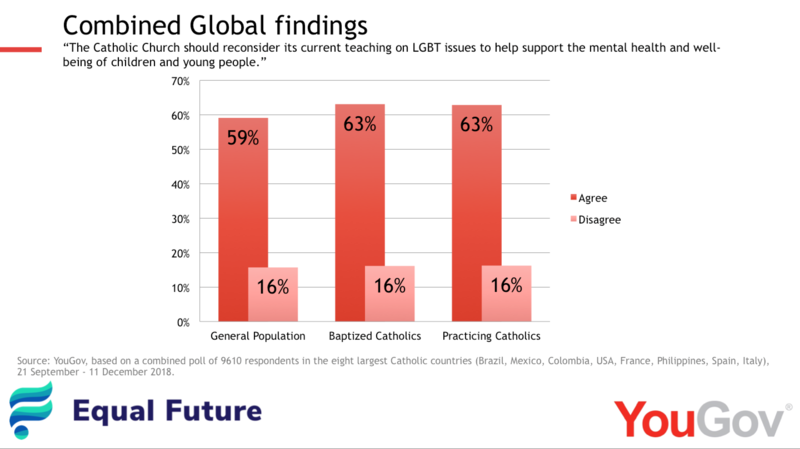 Another key finding related to the view of Practicing Roman Catholics on whether the Catholic Church should reconsider its current teaching on LGBT issues in order to support the mental health and wellbeing of children and young people – across all markets, 50% of the Catholic world globally – 63% of Practicing Catholics agreed it should. Download YouGov’s Executive Summary of the results here. Further detailed data available on request. The above results are of the poll conducted 21 September to 11 December 2018. NB these constitute partially revised data from the original set released in October 2018 (21 September to 3 October 2018) because the polling in France was re-run. YouGov and the Campaign decided to conduct a re-run of the French poll because of an anomaly in the French translation initially used compared with those used for the other markets which, it was felt, may have affected the results for that country (and that country only). In the re-run, the questions in French were better conformed with those of the questionnaires run in the other countries. This, specifically, involved changing the original French questionnaire where the questions spoke of ‘being part of the LGBT community’ to simply ‘being LGBT’ – in order to ensure it was understood that being LGBT but not being ‘out’ was to be understood as included in the question – and from ‘preaching of the Catholic Church’ to ‘teaching of the Catholic Church’ – in order to ensure that it was understood that the official teaching of the Catholic Church was being referred to rather than what may or may not be actually be preached by individual priests. Further information can be provided on request. For completeness, you can find the originally-released YouGov Executive Summary, based on the anomalous data for France, here. Copyright © 2018 Equal Future 2018. All Rights Reserved.